The City of Detroit III was built by the Detroit Shipbuilding Company in Wyandotte and Detroit, Michigan and was designed by Frank E. Kirby. The interior decorations were designed by painter and architect Louis O. Keil, who collaborated with Kirby on many projects. It was owned by the Detroit and Cleveland Navigation Company (D&C) and was launched on October 7, 1911. 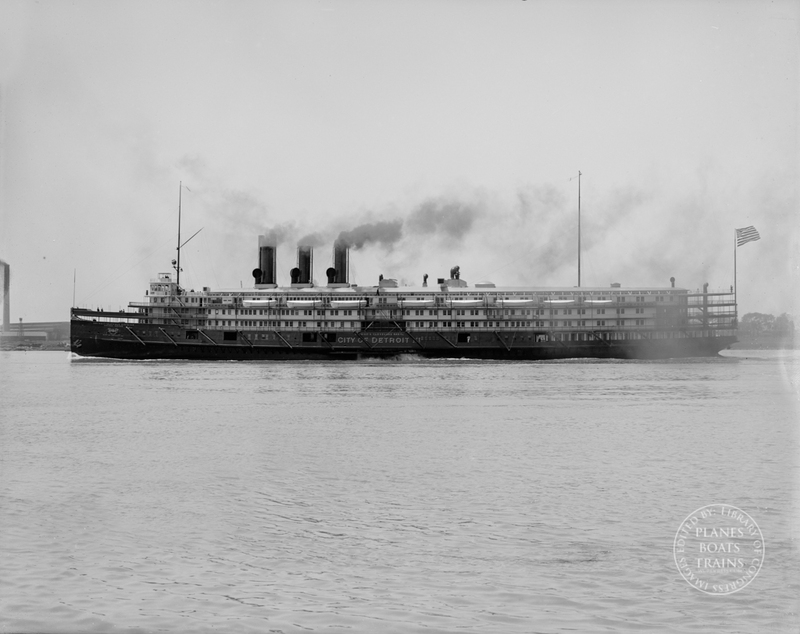 When it was launched the City of Detroit III was the largest sidewheeler in the world. The next year the slightly larger 500-foot (150 m) length over all Seeandbee, another Kirby designed ship, was launched for the Cleveland Buffalo Transit Company (C&B). The City of Detroit III traveled regularly between Detroit, Michigan, Cleveland, Ohio and Buffalo, New York. The City of Detroit III cost $1,500,000 to build ($38.6 million in 2017 dollars) and was ornately furnished. Forty percent of the steamer’s width was situated over the wheels, allowing room for many amenities like salons, a palm court and a winery to be built into the vessel. One of the rooms was an opulent smoking room called the “Gothic Room”, named for its Gothic design. It was built from English oak and included a stained glass window. The City of Detroit III was taken out service in 1950 when the D&C discontinued service. It was sold for scrap in 1956 and was dismantled. The City of Detroit III’s “Gothic Room” was disassembled and re-erected in a barn near Cleveland, Ohio for ten years before it was once again taken down and then partially reassembled and refinished at the Dossin Great Lakes Museum on Belle Isle in Detroit.